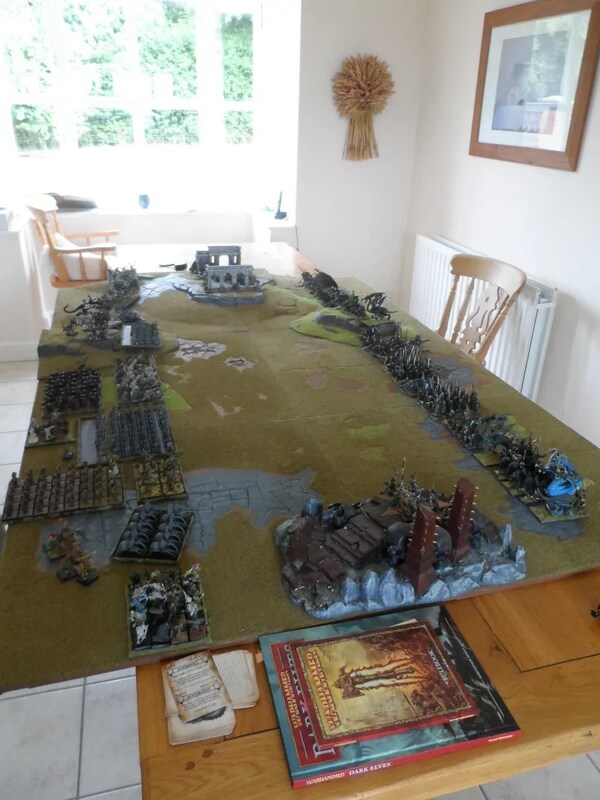 Byakhee Gav and I had a return match on Saturday – again 5k points a side with a full day’s gaming pizza and curry. Our armies were substantially unchanged. I didn’t have time to photo my new heroes before they hit the gaming table. 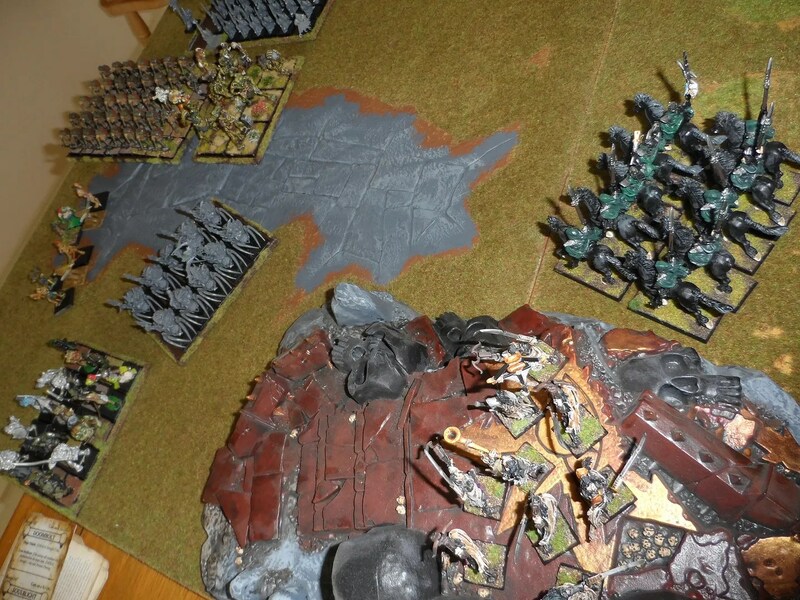 So 5k Orcs & Goblins vs 5k Dark Elves. Deployment was very similar to last time, unsurprising given similar armies ! 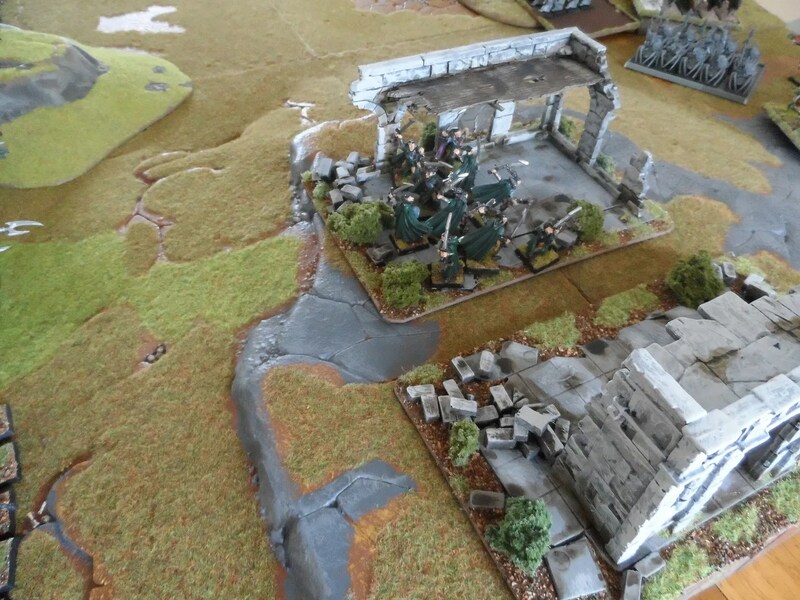 I deployed my Scouts (Shades) well forward in the ruins on both extreme flanks. 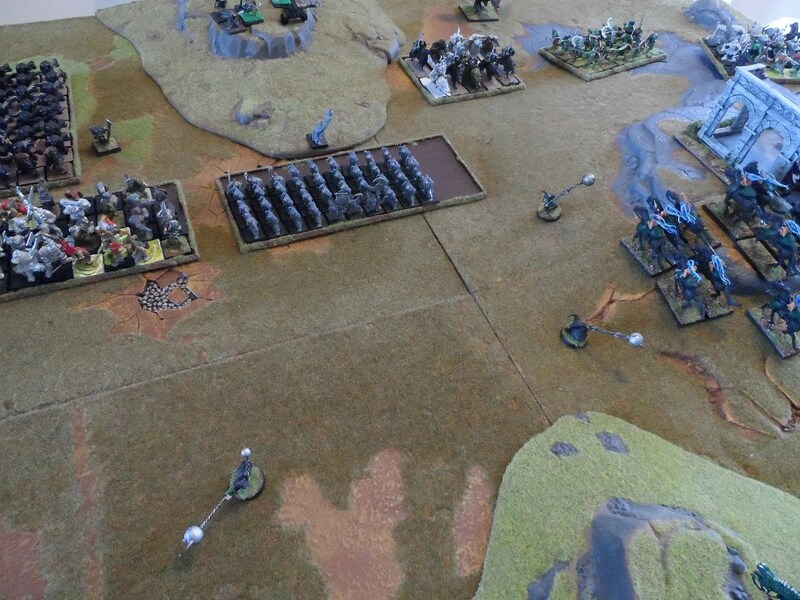 With a hefty back up of Fast Cavalry, and flying critters. 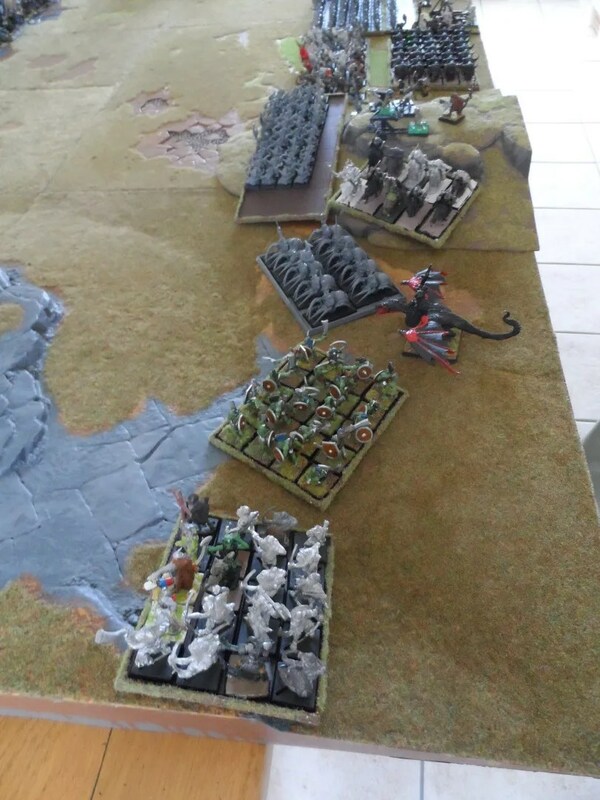 Though Gav won the dice off for Vanguard moves, my scouts stymied most of his moves and (for example) his Goblin Spider Riders only inched (!) 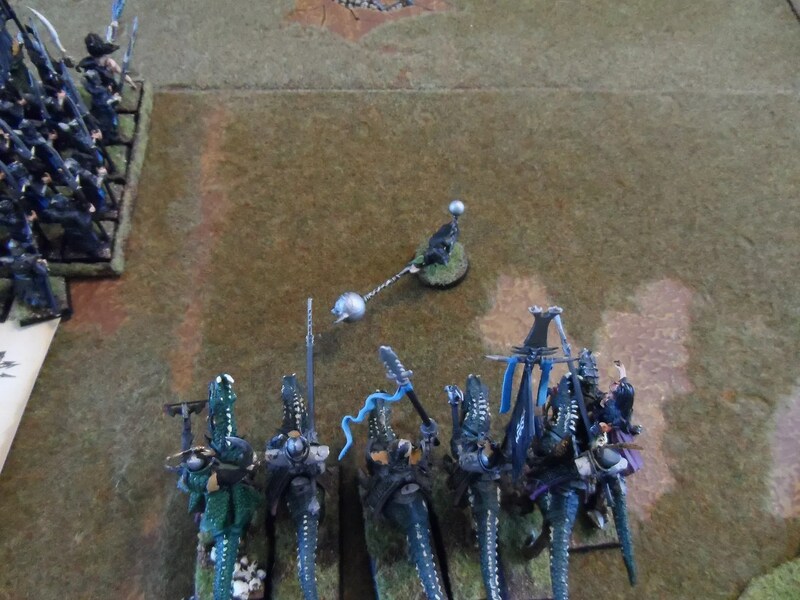 forward, whilst my Dark Riders had full rein to move forward 12 inches to support Mengils’. And the Fast Cavalry on the other flank caught up with the Shades in the ruins. 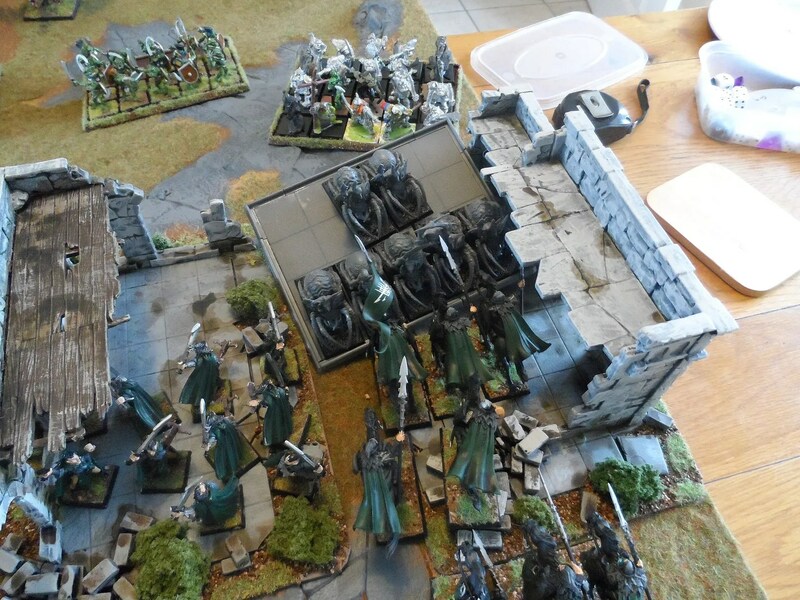 Gav has learnt from me however, and having won initiative took an aggressive approach charging the trolls in against the Dark Riders (eek), and also hexed them to reduce their Initiative. 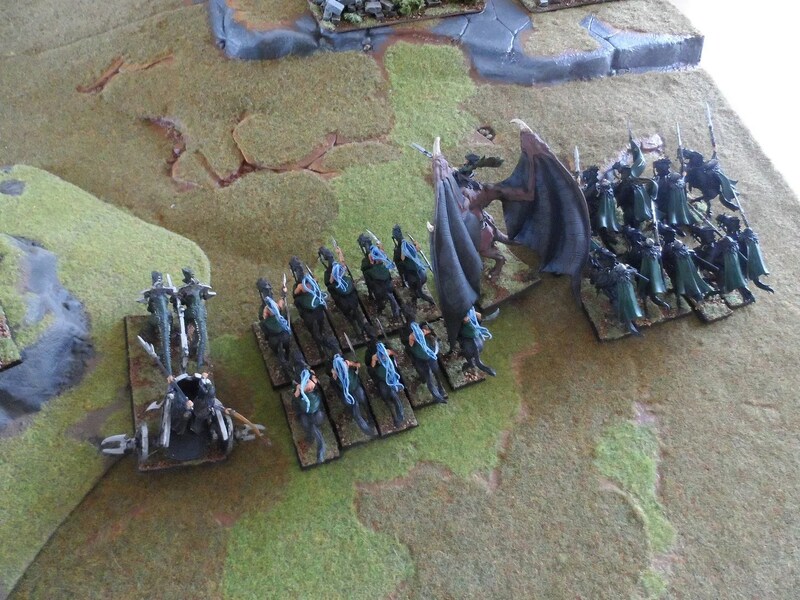 And Spider Riders against the rather cooped up Dark Riders on the other side of the board. 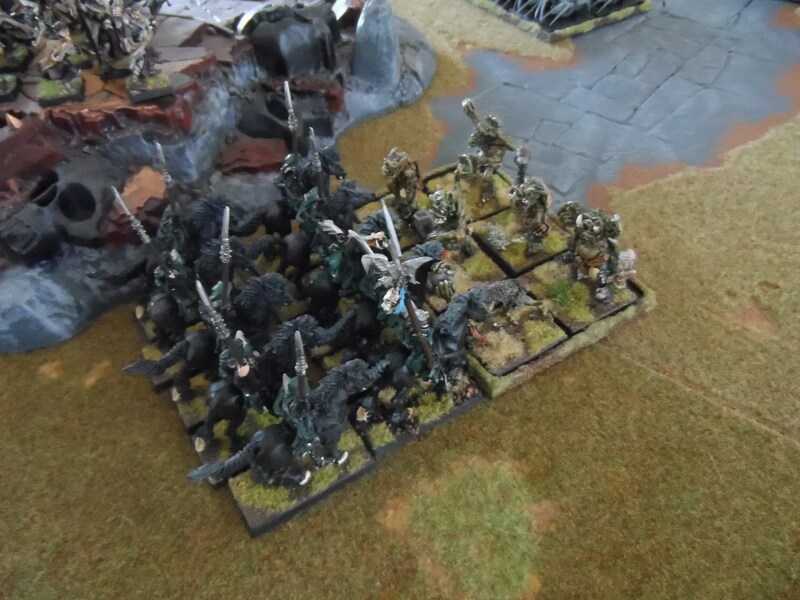 Fortunately, the Savage Orcs had failed their charge due to animosity and the Wolf Riders also failed their charge. 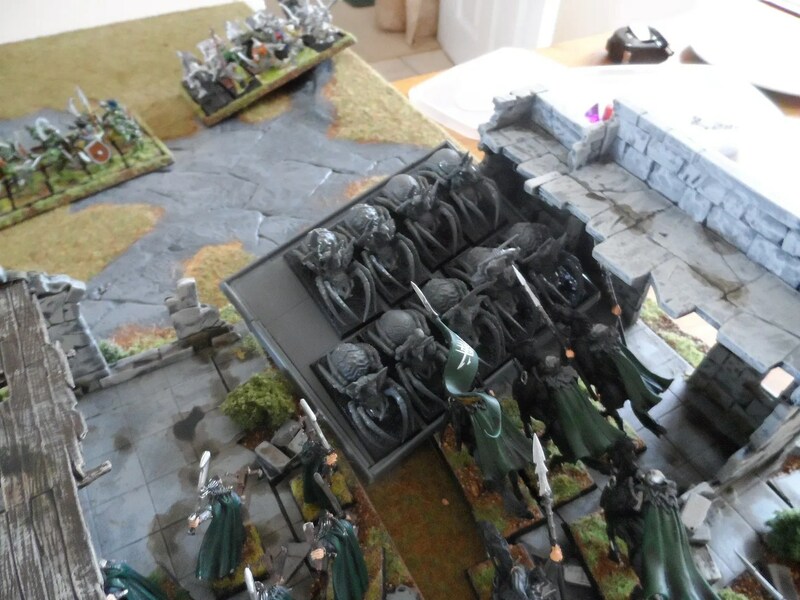 His army as a whole advanced, Night Goblin Fanatics were released and just got in the way. 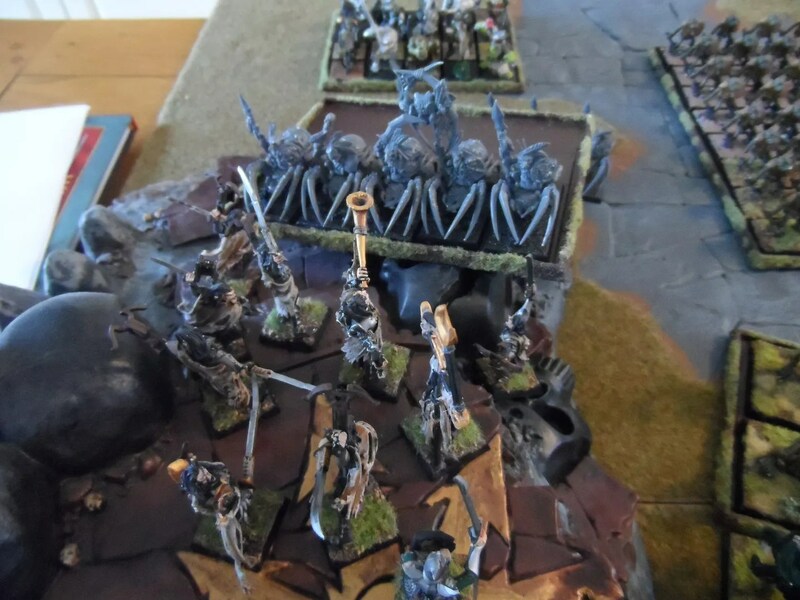 But the Dark Riders held in combat, and allowed the Shades to flank charge the Spider Riders. 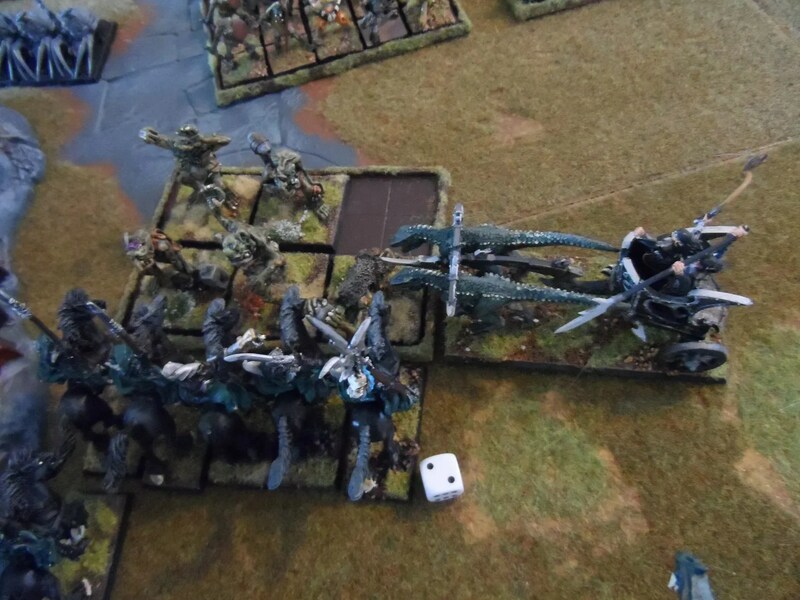 Even a flank attack from a CoK chariot was not enough to save the other Dark Riders from the pestilent Trolls who were busy reliving a friday night’s binge of lager, chips ‘n’ curry on everyone near and far. And could my newly painted CoK Hero with his smart RXB hit a single Goblin Fanatic and kill him – NO – of course not ! So the nutter remained right in front of the CoK unit and I had to take a hit (literally) the next turn and charge through him and take the damage. That was just Turn One, which we finished about 4pm after starting at 1pm…. Contrary to my expectations, I think I am on course to finish off all 6 Heroes on Cold Ones, and the Sorceress on foot by the start of tomorrow’s game. The colours in this photo are horrible – low natural light levels due to incessant rain today and artificial lighting has stopped me completing them this evening. I just need to finish off some of the riding furniture, the gold highlights and the flesh highlights tomorrow morning and they’re all done. So tonight will be spent topping and tailing the army list using these new heroes – I have gone trawling druchii.net for some ideas and have plenty of them. What it has made me aware of, is the need to finish off another 10 CoK at least. Which should fill all the Byakhees with joy. So you deny histroy? Maybe you should consider a job at the BoM. I was going to give a long list of examples, links to articles and research, but then I realised, if you want to know, you’ll Google it yourself. But personally I think you’ll just stick your fingers in your ears and type some more bull about how skeptics are making it all up, so good luck. So as well as being lefty communists, green activists are also Nazis. 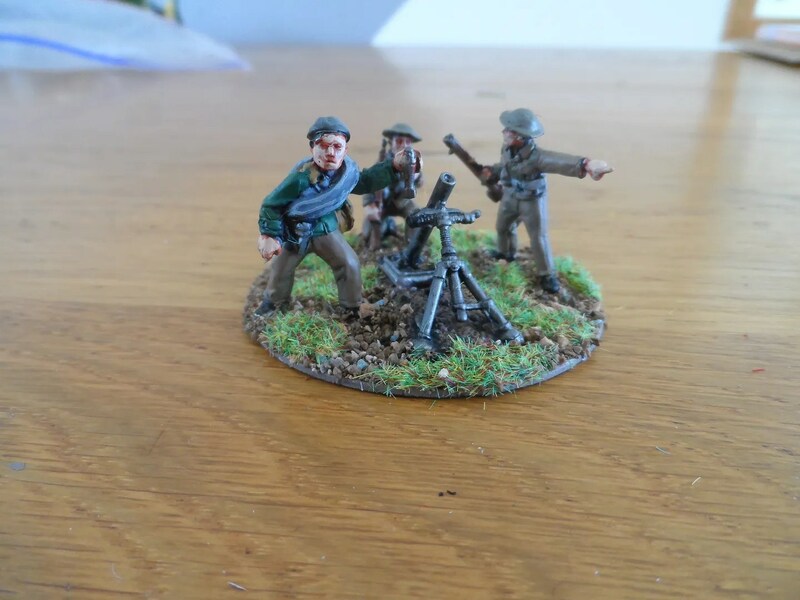 As I’ve mentioned before, I’m trying to deploy a new unit of fully painted figures for each game I play. Well I have a game planned with Byakhee Gav on Saturday (two day’s time), and have decided to do up some CoK hero conversions and an Avatars of War Sorceress. They’re all unique models so will not be run of the mill troops but I’m giving myself a break on the “unit” definition. The CoK Heroes have been 2/3rds done for months and collecting dust with a reproachful look at me every so often, so I think its time they got finished off. I probably won’t do all of them, but I hope to get at least 3 done, along with the Sorceress on foot that Byahkee Rich pinned for me and rediscovered a month ago. 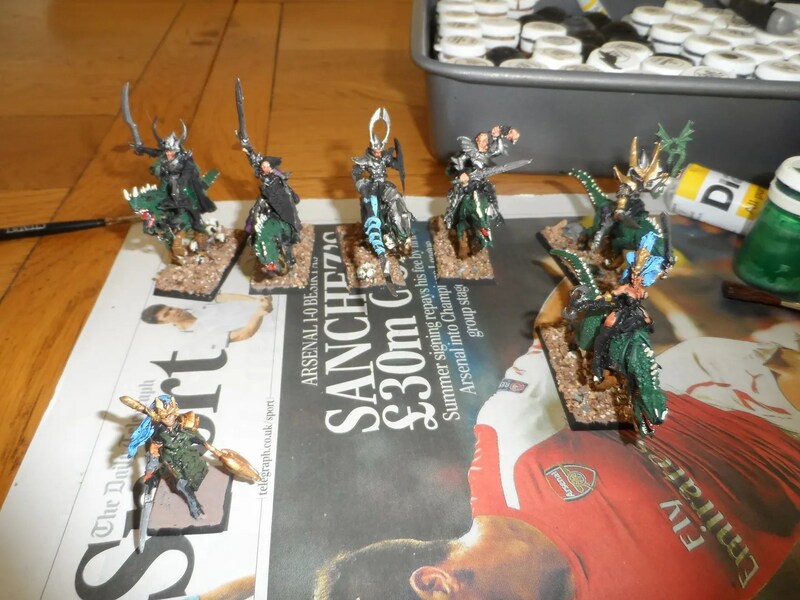 This also means I have to delve in to the DE Army Book, and my spreadsheet to build the heroes – not having had the models means I didn’t build the heroes with all their stats and weapons in my spreadsheet. 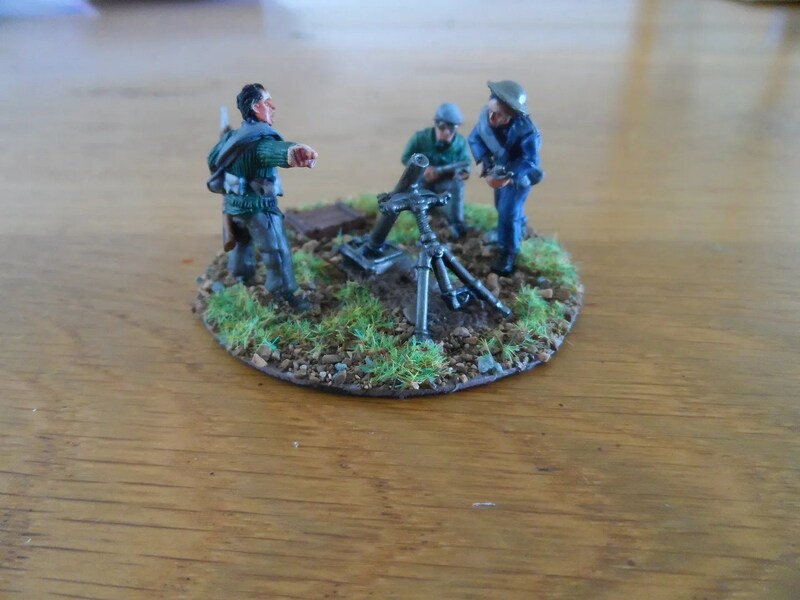 I’m also busy varnishing figures – my local GW store closed briefly as the manager resigned and they took time to recruit a new one. So I have a backlog of stuff to varnish and of course in this wet weather since it re-opened, I haven’t been able to spray without fear of spackle. 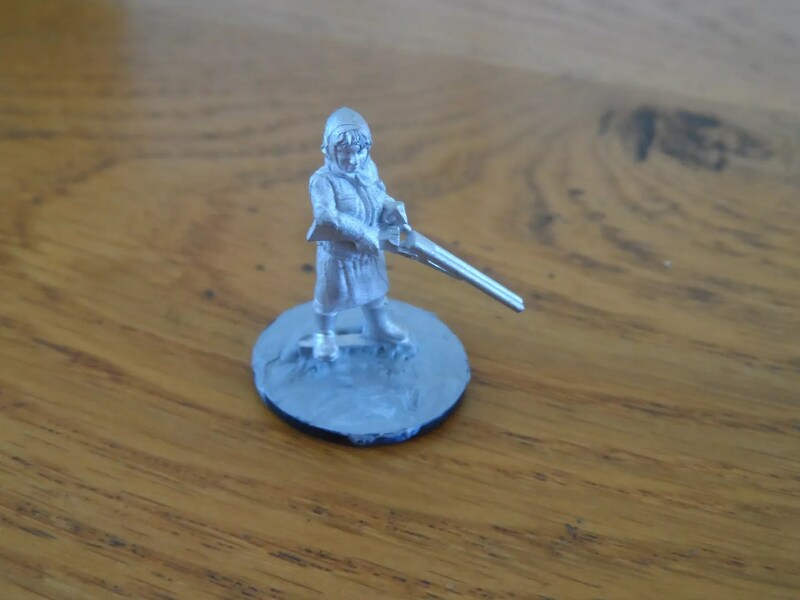 Bizarrely, in amongst the CoK Heroes, I re-discovered this figure by Hasslefree miniatures of Her Madge, loading a shotgun. 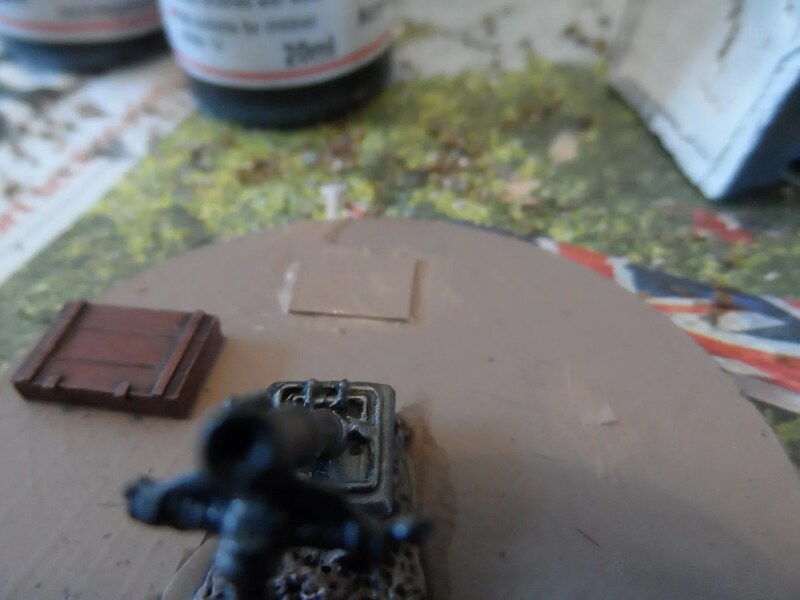 Having just finished the AVBCW shotgun unit, I’m aiming to get her Madge sorted over the next few days (not for Saturday, shotguns don’t appear in the DE Army list (yet)) and ready for the september Big Game. 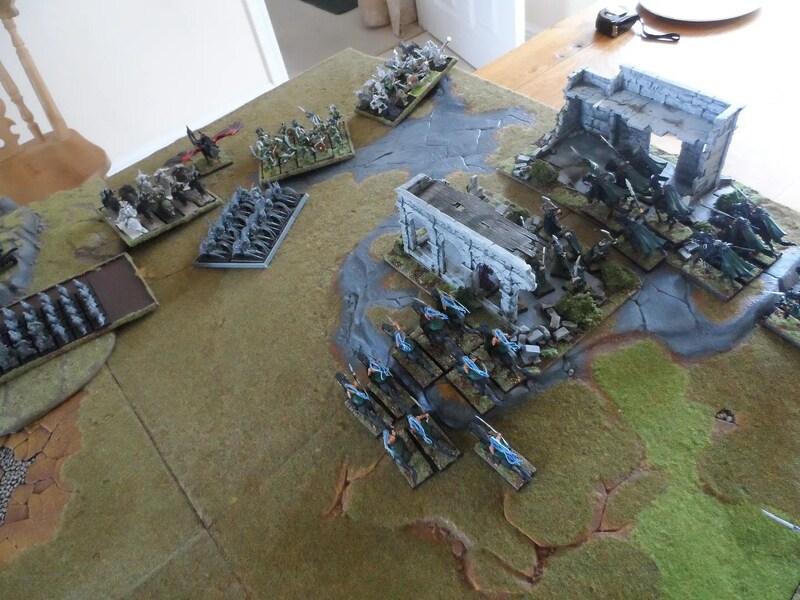 Update tomorrow on how I’ve got on, and then loads of piccies over the w/e as the WHFB game Gav and I will play will again be a 5k event, and hopefully complete my hat trick of victories (pride comes before a fall). 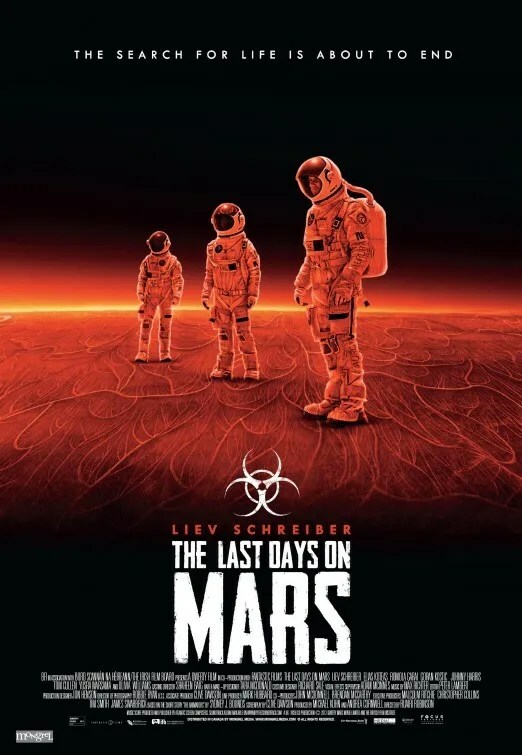 As well as the pile of crummy b/w westerns I bought, I also picked up this DVD: The Last Days on Mars. Never heard of it but took a punt on it. Turns out it only had a limited cinematic outing and got so-so reviews. Anyhow i watched it at the w/e, and again yesterday after recovering from my parents’ visit. The premise is quite simple: The team of the first manned station on Mars (Tantalus station) is packing up ready to be relieved by a new team, and are keen to find something to make their mark in the history books. 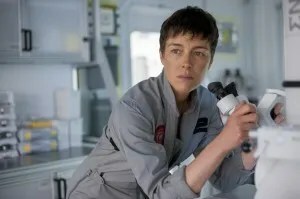 One of them does just that discovering what appears to be evidence of biological activity – and of course decides to revisit the site of the discovery at which point it all goes a bit pear shaped. More of which later with spoilers. As I said the film is not bad, and is actually quite good. The downside I felt was the beginning sequence, where the 8 crew are introduced, along with the great discovery. This was IMHO rushed. the first time I watched it I lost track of the characters. It was on the second viewing that I appreciated that actually, the characters were well drawn, it was just the pacing was too quick. The character above (Kim) was a hard arse character, and should have got more time to be developed so that her (inevitable) betrayal was more punchy. The rest of the film was better paced, if somewhat predictable, except for the final sequence where the relief team acted like dummies. The final scene though was unpredictable. As well as the over fast pacing, it is not shown why Dalby is so upset by Marko’s loss, nor why the team should try a night time rescue of a non-responsive crew member from a fissure without the right equipment – a few more torches might have helped a lot ! The mirco organism itself could have done with some more explanation – I’d have extended the scene where Kim find’s Marco’s records and expand on what sort of organism it was, with Kim speculating on how it survived, what it was and so on to build up the tension as to why they really didn’t want to mess with it. 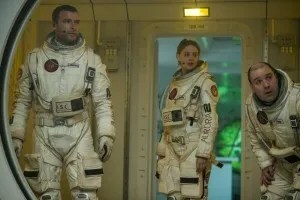 Similarly, whilst the surviving team members were agog at how their ex-team mates, exposed to mars’ tenuous atmosphere were still up and going, we could have had a description (at least alluded to) of the damage to the human physiology of exposure to those conditions, again ramping up the tension. Then there is the examination of the blood from the team leader, again some speculation could have been added as to how the organism was reprdoucing, what it was doing and how it was making the cadavers move. Well those are three negative things, but I still think the films a good ‘un. Not the best but still good. The final fight sequence and aftermath were good. And the bleak ending was in keeping with the hard edged nature of the sci-fi in the film. I’m entertaining my parents on Monday evening, and after the meal we’ll watch a “family” film. They have a very conservative and restricted viewing range of films, mostly b/w westerns, where the good guys wear white hats and bad guys wear black hats. I’m not to averse to that to make a change from the modern CGI fests which are quite frankly boring in many cases. So, having been primed with a list of “acceptable” films I went on a binge on Amazon. 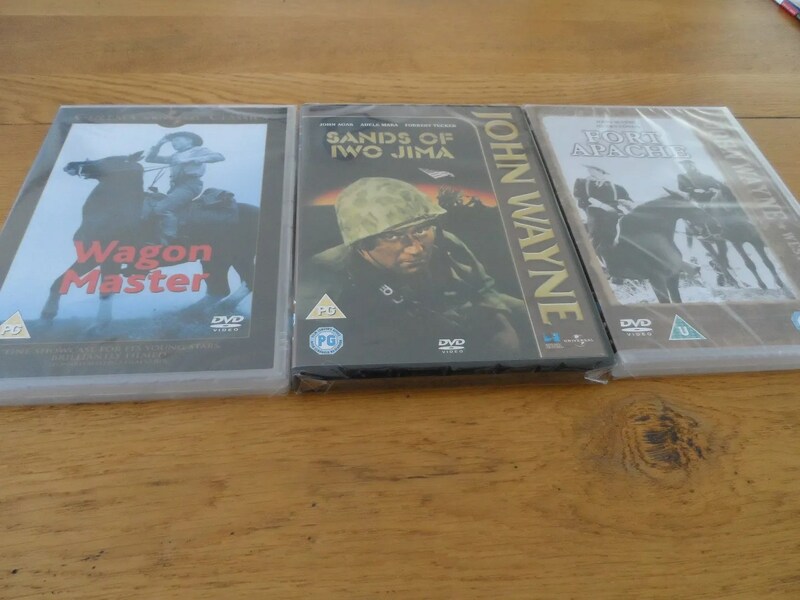 I don’t have a TV licence, having dispensed with that nearly a decade ago due to the mindless dross that is pumped out, and having done the maths worked out its better to invest in DVDs of stuff I actually do want to watch year in year out. John Wayne helps the drunken Sheriff (Robert Mitchum) defeat the bad guys. John Wayne helps the drunken Sheriff (Dean Martin) defeat the bad guys. Both directed by Howard Hawks. I might mock them, but these films are all useful for dreaming up scenarios for RPGs and wargames as they are relatively simple and easy to understand. Often I, and others try and run before we can walk when presenting scenarios to players we rarely game with and have had little chance to build either a rapport with, or ongoing narrative. Amazon or someone, saw fit to send me this DVD: Postnatal Rescue. A more inappropriate DVD for me would be hard to imagine. Maybe I’ll watch it with my mother on Monday. 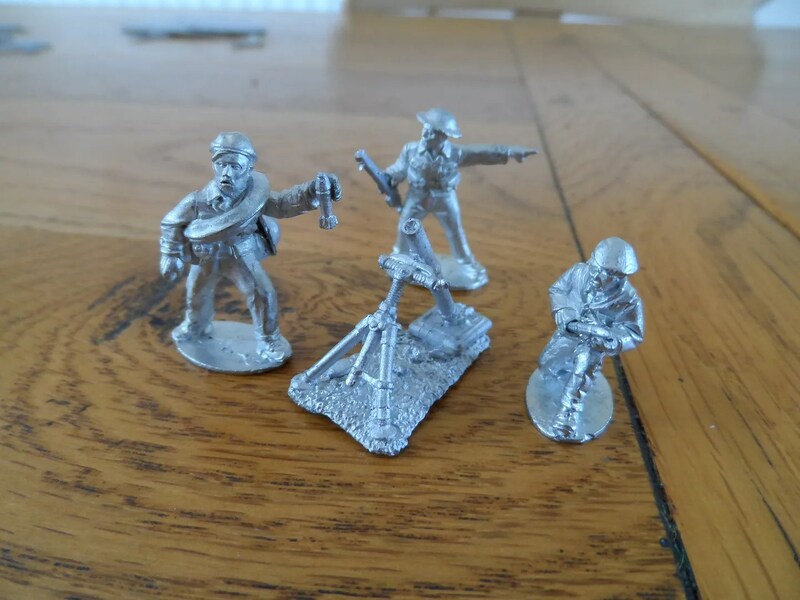 To accompany the HMG I bought from Mort, I got two mortars and crew. 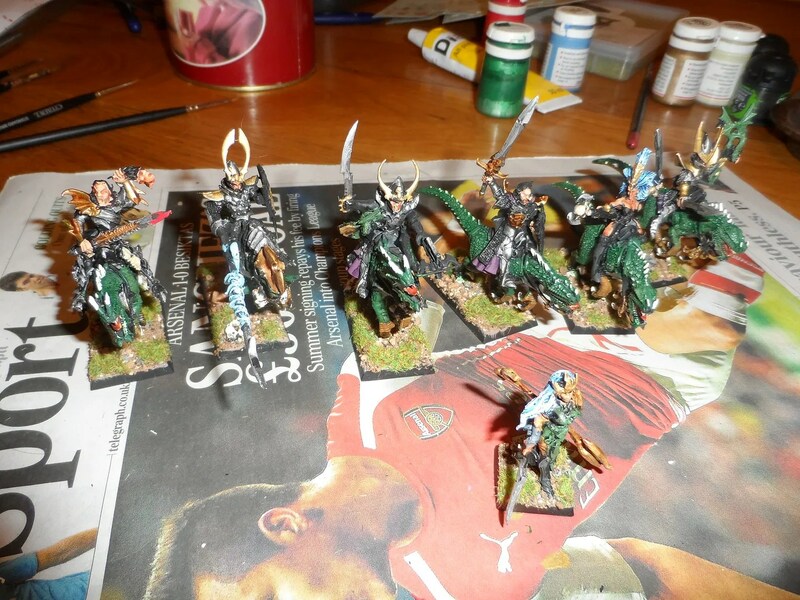 These were Empress SCW miniatures that he had converted for AVBCW. The crews as originally received underwent a few changes of personnel. I’d also already asked Mort to change some of the rifles to SMLEs to enhance their “British” nature. It was nice to paint some colours other than khaki. Though the colour palette of the average 1930’s british bloke is still fairly limited. For the second mortar, I also had a minor issue that is worth raising. Mort had suplied a box (of mortar shells), but as it was very thin, so I built it up by adding card to the base so it was more distinct above the scatter/flock. 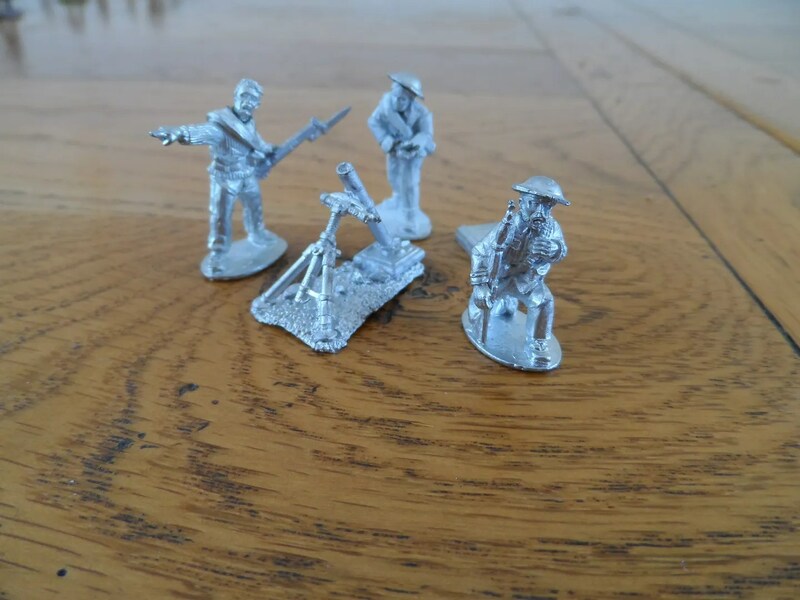 These add on accessories are often lost in the noise – figures are usually on bases, not so boxes of ammo and so on. They get lost on bases when there is flock and static grass. Its really simple to solve but often forgotten.